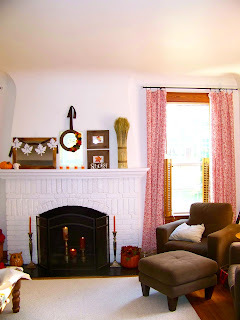 Last weekend I got around to doing a little bit of decorating for fall. I still have more to do around the house but I was able to get the mantel all festive looking (and smelling). 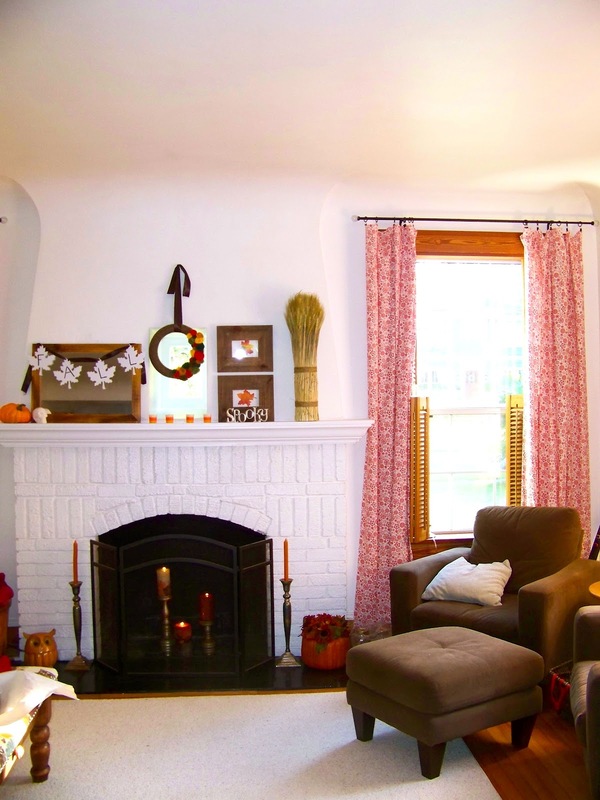 I really like decorating for Halloween and Thanksgiving in a more general fall theme. Each year we add a little bit to our collection of decorations and this year a lot of candles were added. I went for a mostly orange and brown theme with a touch of other fall colors. I find this festive without being overwhelmingly themey. I used the wreath that I made last year as a way to decorate the center portion of the fireplace but still let light through our cool little window. I also made a small FALL banner out of cheap leaf paper cutouts and a left over piece of ribbon. Halloween is represented by our little skull and spooky sign as well as som candy corn candles that I got for $1/candle. On our house to-do list is to add a gas fireplace insert but until that happens, we are filling the house with awesome fall smells from candles that we picked up at Pier 1. The owl is also a new addition this year although he may find a home somewhere else once we get pumpkins. I always love how homey our house feels when things are clean and decorated and we can light some candles. It really helps me enjoy our space when I get to be home. I still have the dining room to decorate which includes the chandelier which is always fun! Very pretty. I like the candles in the fireplace. I've been looking for some wheat bundles like the one on your mantel! Happy Friday! 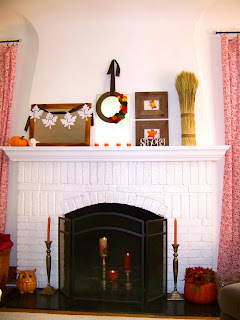 How nice your mantel looks, I like the fall paper leaves and MR OWL. I also realy like your curtains. I love how this looks!! I especially love the wreath! New follower here! Would love for you to visit me and join my site as well!